"You think you can act. You've never experienced anything worse than a cut finger." The craft of acting is slightly mysterious, a mimicry of life upon a stage. While producing such a simulacrum might seem easy to the spectator, the difficulty of producing an interpretation that is both believable and has something more to say than everyday life is a difficult balance to achieve. Esther Kahn follows the career of the title character, a young Jewish girl, as she struggles to realize her dream of being a great actress. Set in late 19th century London, the film follows Esther (Summer Phoenix, sister of River and Joaquin) as she starts off working in the sweatshops with her family. 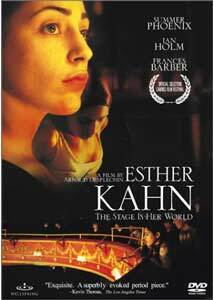 Awkward and inarticulate, Esther only comes alive when she goes to the theatre. She obtains bit parts for herself, acting as understudy while she is given lessons under the wing of fellow actor Nathan Quellan (Ian Holm). We see her development to the point where Nathan can no longer teach her; she must obtain the rest of her training by experiencing life, and in particular, love. Love does not come readily to Esther, however, though she forces herself into a relationship with critic Philip Haygard (Fabrice Desplechin). The evolution of this relationship provides her with both her greatest challenge and an opportunity to perfect her craft. Phoenix turns in a fine and compelling performance of both the clumsy adolescent Esther and the more mature woman. The part demands a range from showing no emotion whatsoever to painful paroxysms of feeling, and she capably handles the entire gamut. Ian Holm is excellent as always as her mentor. I question the casting of the director's brother Fabrice as the critic, since he is quite unable to overcome his dreadful French accent; at best he comes up with something that sounds like a low-rent Bela Lugosi imitation. He is obviously the weakest part of the production, which otherwise nicely evokes late 19th-century Spitalfields (a poor ghetto in close proximity to the site of the crimes of Jack the Ripper at about the same period). Costuming is elaborate and highly suitable. The musical score by Howard Shore has some oddities, including a tendency to have dread-inducing tense motifs for no apparent reason. It feels at times as if it has wandered in from some other film altogether. Those who winced at Bruce Willis walking barefoot through glass in Die Hard will find a scene here that will send them screaming from the room. The picture is burdened somewhat by an occasional narrator (Ramin Gray) who feels quite obtrusive and inappropriate; why a male narrator was used for what is at its heart a woman's story is beyond me. At least the filmmakers avoided a 42nd Street-type storyline; when Esther gets an opportunity to play a lead on the illness of one of the actresses, the event is mostly unobserved and unnoticed, and she returns to her role as understudy. The pacing at the beginnning is glacial. This will lose some viewers, but it does help one become immersed completely in the time period, where matters moved at a much slower speed than today. Whether this picture has anything more profound to say than that acting requires a modicum of life experience is debatable, but the exercises that Nathan provides to Esther are certainly fascinating. Every step, every gesture, every action needs to convey meaning of some kind, and it is up to the actress to go beneath the text to find that meaning. Nathan apparently anticipated the Method by about fifty years, but the result is certainly intriguing. Image Transfer Review: The anamorphic widescreen picture is generally attractive, though often shrouded in shadow, which is appropriate for a story that takes place mostly under gaslight. Accordingly the color is not naturalistic for the most part, but tends toward golds in the theater and greenish hues in the ghetto. There is an intentional emphasis on drabness, but the occasional flashes of other colors look good when they are present. Dark scenes tend to be a bit on the muddy side, with shadow detail rather lacking. Audio Transfer Review: Both a 5.1 and a Dolby Surround soundtrack are provided. Both mixes are quite enveloping with a good deal of atmospheric sound throughout, with plenty of activity in the surrounds. The sound is crisp and clear at all times, though the dialect is often difficult at times to make out. This however is plainly a fault of the actors (and of the lack of subtitles) rather than the audio mix, which lacks hiss, noise or other interference. Extras Review: Although there are a fair number of extras included here, they are of dubious quality. First up is an interview with Summer Phoenix (6m:20s), which is heavily larded with film clips, while the credits take a minute of the running time. Phoenix seems just as inarticulate about her performance as is Esther Kahn, so this aspect of her performance probably was not a significant stretch. After hearing the quite plausible British accent she adopts for the film, it's certainly jarring to hear her normal speaking voice with its flat American accent. A single deleted scene of a peculiar dream sequence is presented, without any word of explanation or discussion. What is presented as a theatrical trailer on the keepcase in fact is merely an ad for the video and DVD. Brief bios and filmographies for Phoenix, Holm, Frances Barber and Fabrice and Arnaud Desplechin fill up the rest of the extras quota. While the chaptering is adequate, the layer change is badly placed in the middle of a line and is very jarring indeed. Clearly those doing the mastering were asleep at the switch here. A slow-paced deconstruction of what it means to be an actress, following a young woman as she struggles to perfect her art. An attractive transfer, but the extras are mostly fluff.